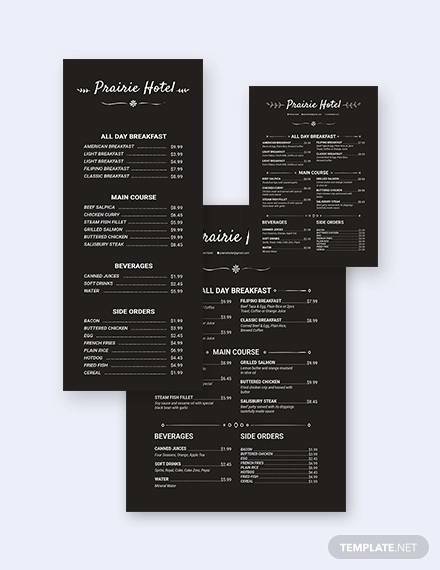 The tri-fold menu is used in cafeterias, hotels, and restaurants. 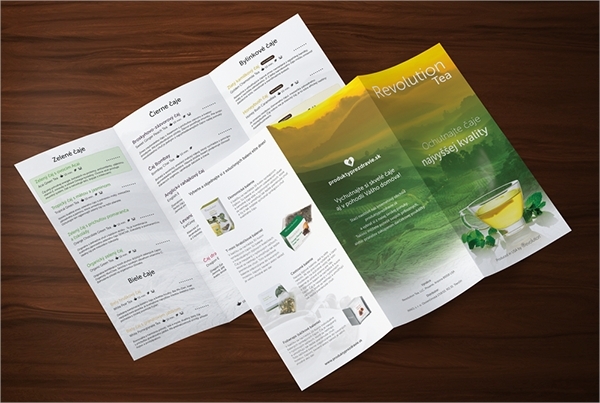 The tri-fold brochure is attractive to the customer and normally they like the look and feel of the same. It can fold and hence occupies less space. 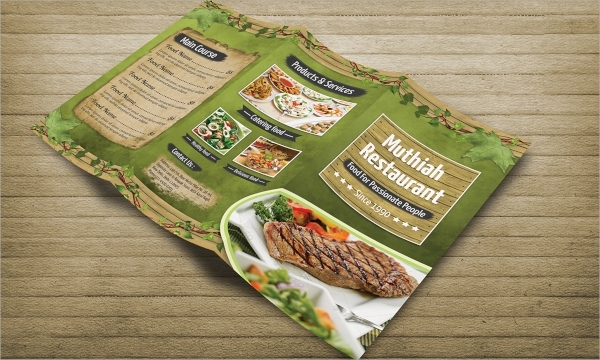 The brochure design should be a contemporary design so that people are attracted by the menu. The menu should be able to display the brand of the organization. 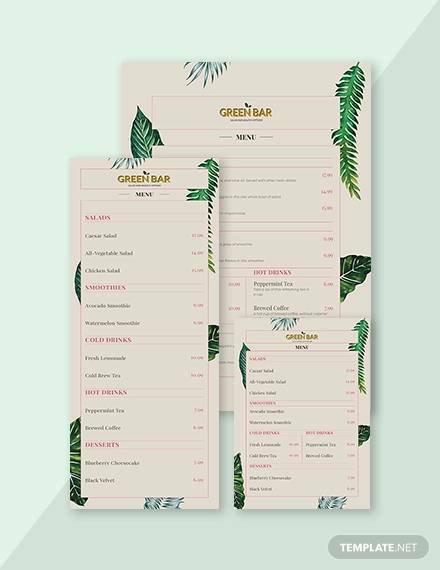 The menu design is printed on good quality paper. 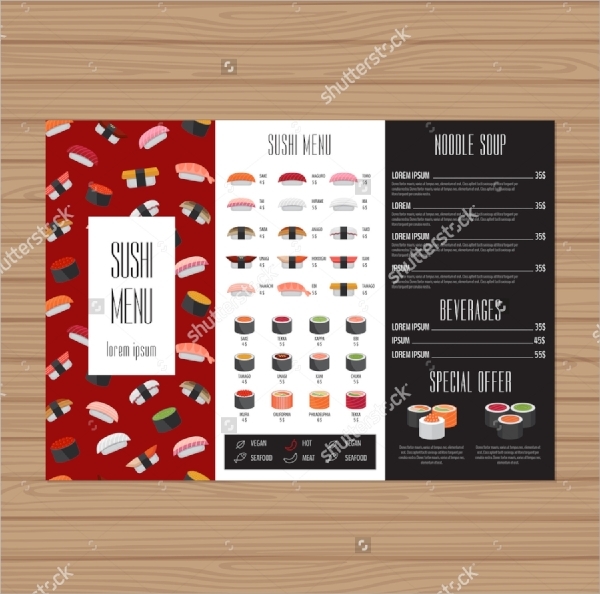 The size of the menu can be decided based on the need..
A3 is the size of the paper on which tri-fold menu template is printed. 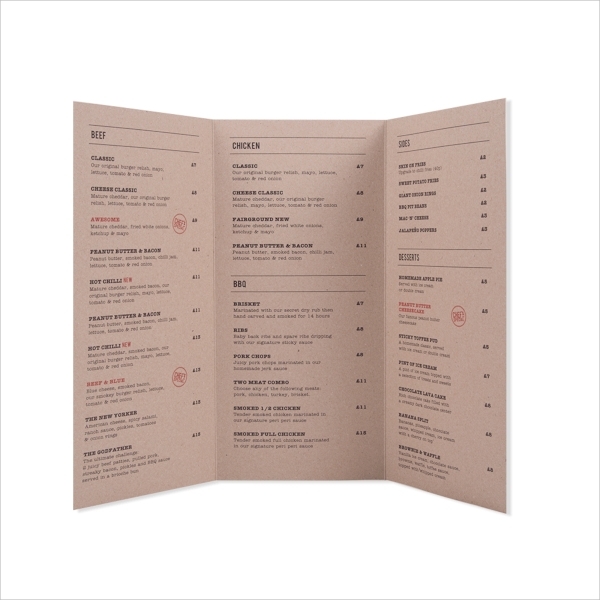 A3 is slightly bigger than A4 and the menu measures 29.7 * 42.0 cm. 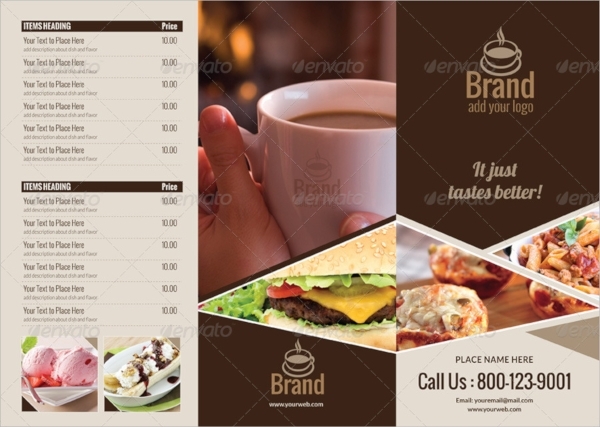 The tri-fold menu is slightly larger and helps to fit more content within the menu. 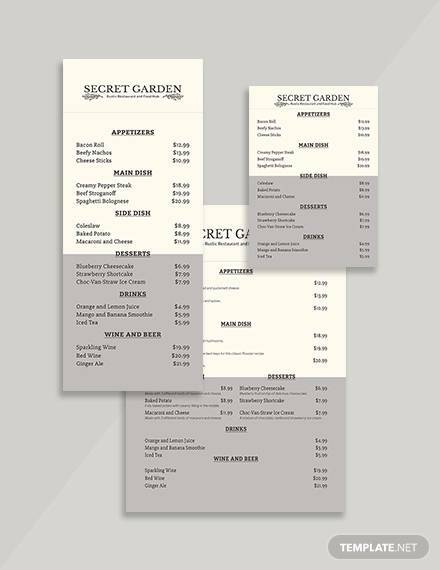 A bigger menu makes it easy to read for the customer. 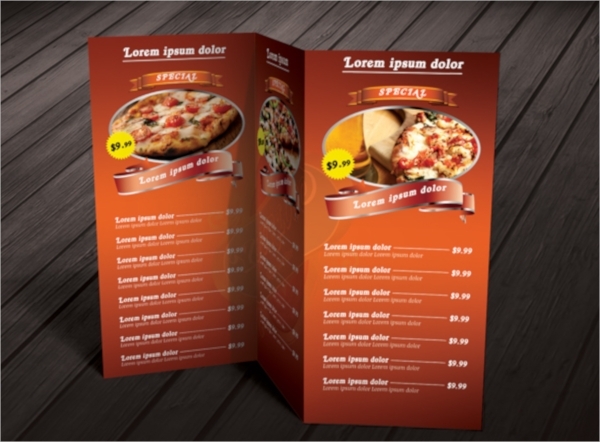 An attractive design can also fit into the menu. 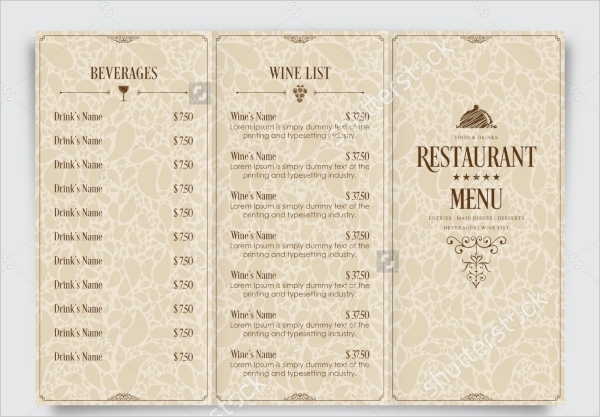 Vintage tri-fold menu template is stylish menu cards especially used in a posh restaurant. 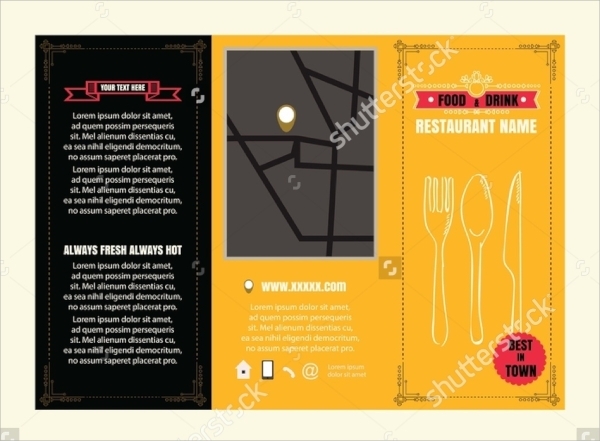 Vintage menu cards give a look of style and also of old style. 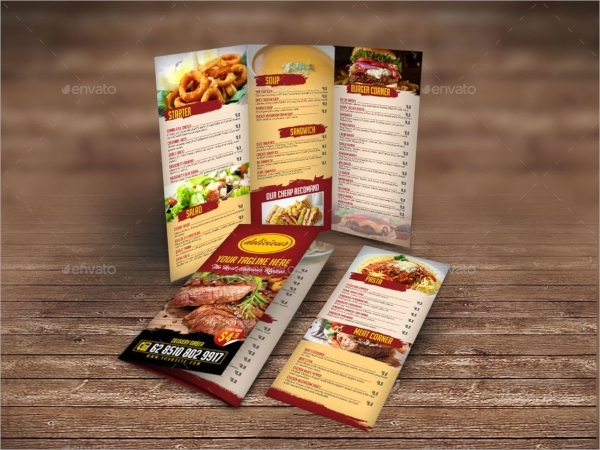 Anyone who wants to advertise his restaurant can use vintage tri-fold menu to create an impression. 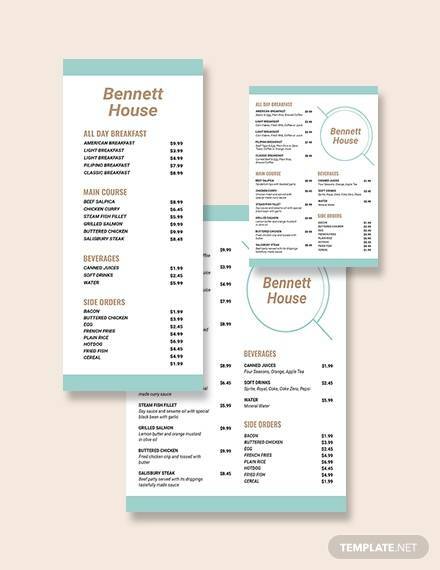 Customers come to the hotel and take the tri-fold carry out the menu so that they can refer to it when they need to order from home or take a parcel. 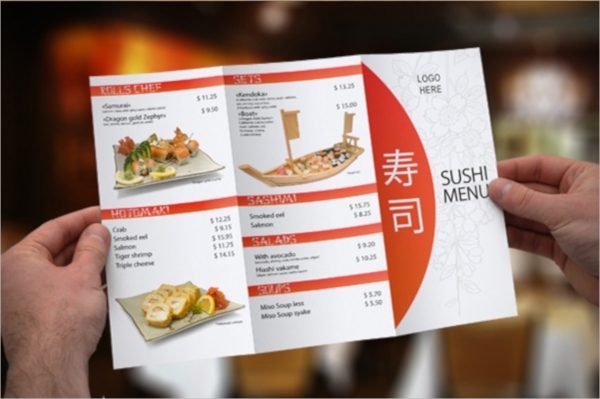 The carry out menu is normally made on thin paper so that people can fold that and keep it in their pocket. 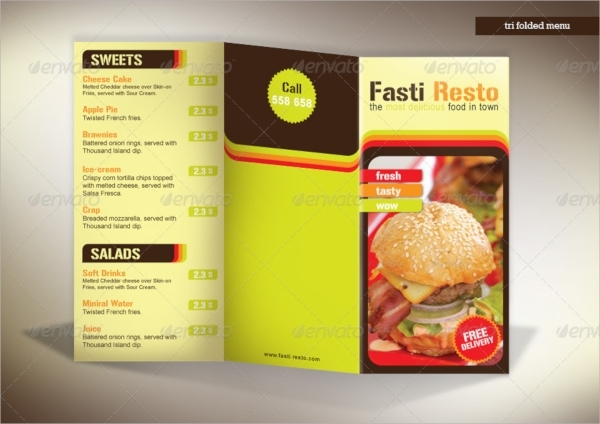 This menu is kept in a customer’s house and it should look attractive so it acts like a good marketing brochure. 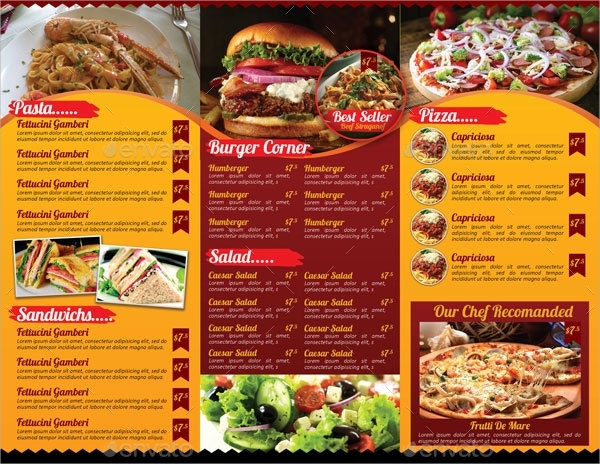 The tri-fold carry out menu is normally kept in bunches at the restaurant counter. 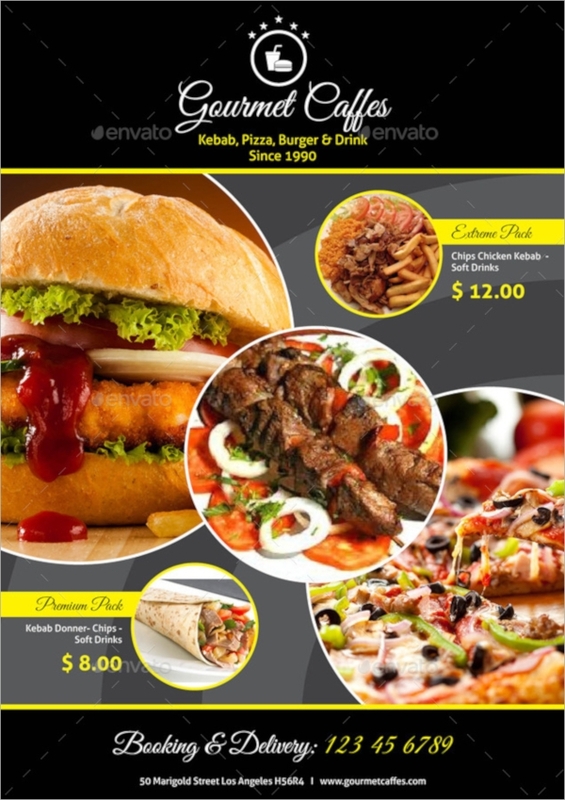 It is for people who come to order take away food they can look at it and order for food. People can refer to this menu for ordering from the house and the hotel would deliver the food. 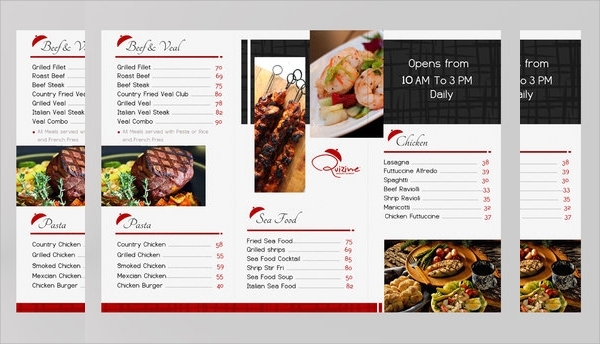 The tri-fold carryout menu has other details like contact numbers and address of the hotel which allows customers to call and order or to reach the hotel. 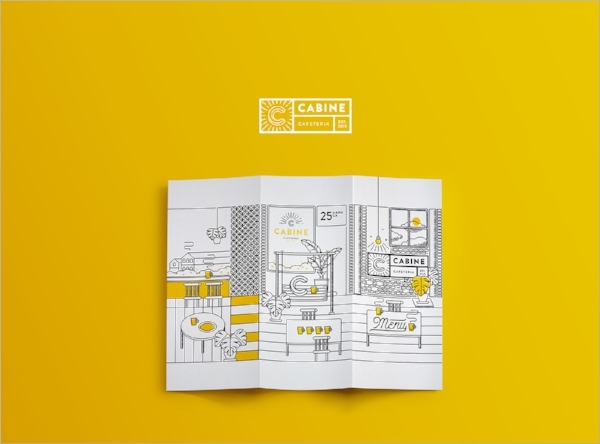 It acts as an advertising brochure. 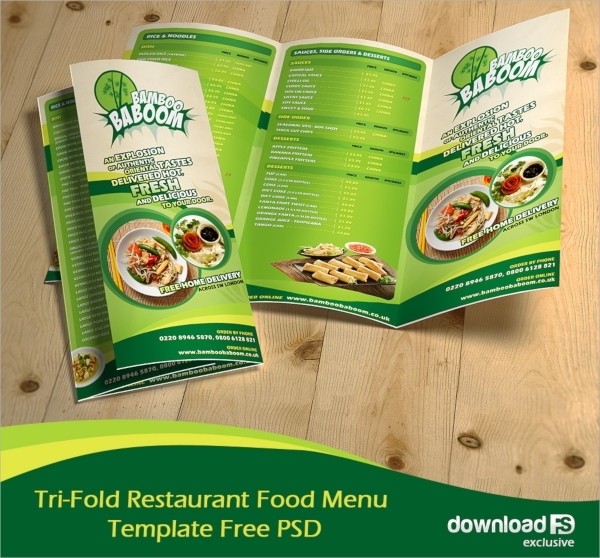 There are tri-fold menu templates available in Microsoft Word and also in design software from Adobe. 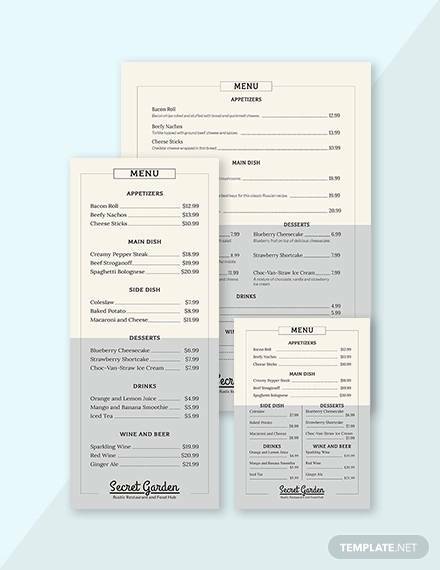 We can download these templates and use it to create our own design and type all the menu items. 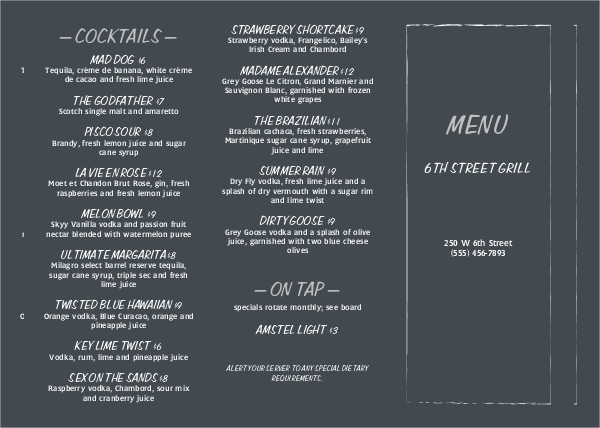 A good designer is needed to design the tri-fold menu. Once the design is finalized it can be sent to the printer for taking multiple copies of the same. 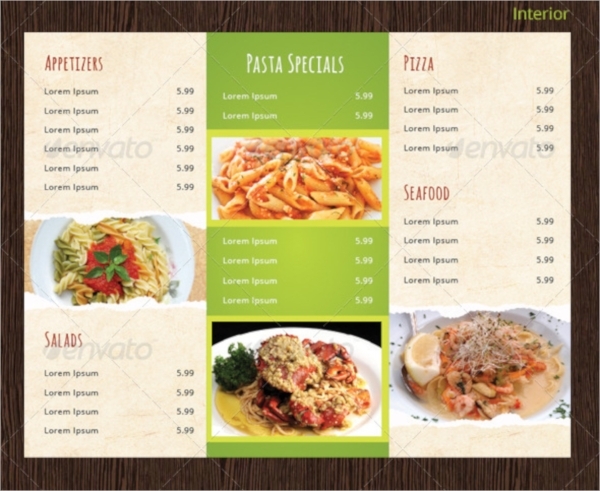 These templates can be bought from websites and they can help in creating the final menu. 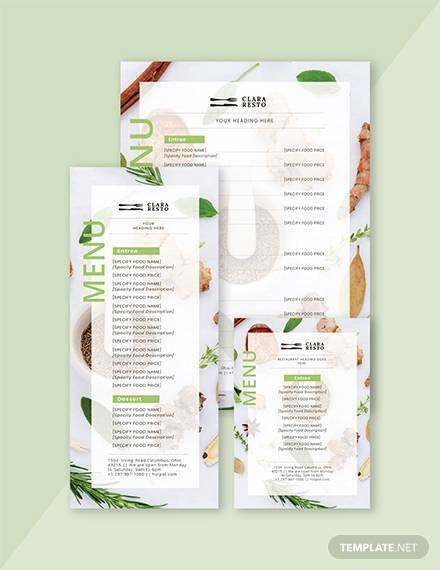 We have tri-fold menu templates available on our website. You can download the same and then customize the same. You may contact us for the customization. 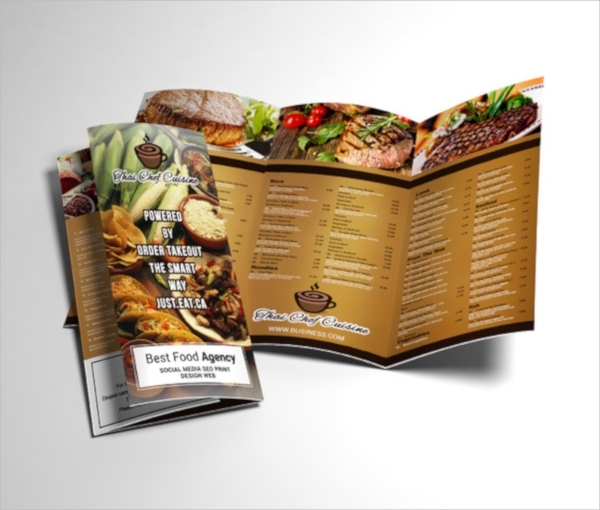 We will do what you need and you will get a tri-fold menu as per your requirement. We will give that in different formats so that you can maintain as you like.